“Louder Than Bombs” is a sort of ghost story, though not of the white-sheet-bump-in-the-night variety. The first American film from Norwegian auteur Joachim Trier is a quietly devastating study of a father and two sons cut adrift by the death — a suicide, it turns out — of their wife and mother, and how they are haunted by memories, doubts and uncertainties. Isabelle (Isabelle Huppert, seen in flashbacks and dream sequences) was a photojournalist who specialized in war coverage, not so much of the fighting as of its human toll. Two years have passed since her late-night death in a car crash just miles from her suburban New York home. Her husband, Gene (Gabriel Byrne), a former actor now a teacher, has tried to keep his boys on an even keel. The oldest, Jonah (Jesse Eisenberg) is a sociologist with his first university teaching appointment, a wife and a new baby girl. The younger, Conrad (Devin Druid), is a brooding, uncommunicative loner who refuses to give his concerned father the time of day. It probably doesn’t help that Gene is on the faculty of Conrad’s high school, and thus always lurking just around the corner. A gallery retrospective of Isabelle’s work is being planned by a journalist colleague (David Strathairn), whose essay about his deceased friend specifically names her as a suicide. While Jonah has long been aware of this, Conrad is still under the impression that her death was a random accident. Gene must find a way to tell him the truth. Though it is based on a novel by Fyodor Dostoevsky, one could be forgiven for thinking “The Double” is an adaptation of Franz Kafka. Richard Ayoade’s film gives us a hapless protagonist trapped in a web of illogical but rigid social and political rules. This poor schlub finds himself living in a nightmare from which he cannot awaken. The problem is that for me dramatizations of Kafka never really work. They may be well acted, imaginatively mounted, and they may deal with important human issues. But what seems subversive and insightful on the printed page always comes off as a bit silly and, worse, boring when brought to the screen. Kafka-ish yarns are always about an Everyman…and Everymen aren’t all that interesting. Once in a blue moon a director takes a Kafkaesque situation and makes it both funny and compelling — Terry Gilliam’s “Brazil,” for example. 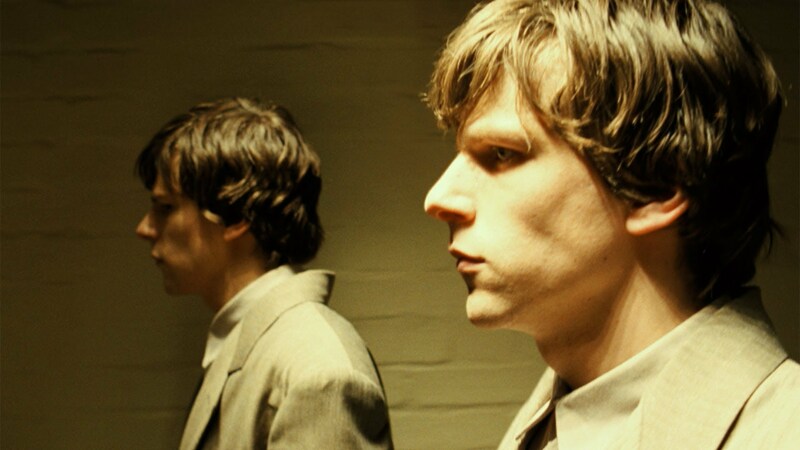 “The Double” works about half the time, thanks to its depiction of a glum alternative world and a bravura double performance from Jesse Eisenberg. But it can’t quite make it over the hump. Eisenberg is best known for playing dweebs in films like “Zombieland” and “Wonderland” and — let’s face it — “The Social Network.” Here gets to play not only a disaffected dweeb but also his lookalike tormentor. Two characters that are polar opposites. And, yes, the kid can act. He’s so good here I wish I liked the movie more. 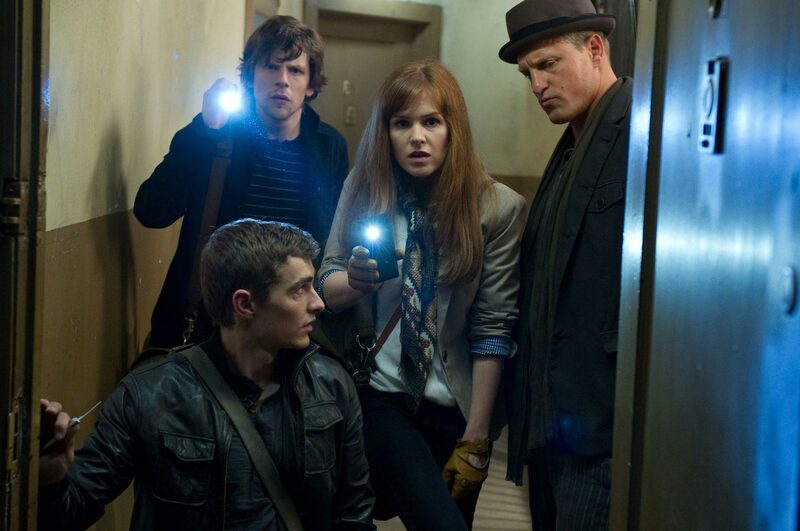 Simon (Eisenberg) lives in a grungy, ill-lit metropolis in which technology seems to have peaked around 1935. He’s employed by some sort of government agency ruled by the Colonel (James Fox), a paternalistic Big Brotherish figure in a white uniform. Exactly what this agency does is never made clear, but it must be important since it has a high degree of security. When he leaves his ID at home, Simon has a hard time convincing anyone at work that he’s been coming there for years. He’s that forgettable. Our man yearns for success but is totally lacking in the qualities that might bring it. He’s got no self-assurance, creativity, or charisma. 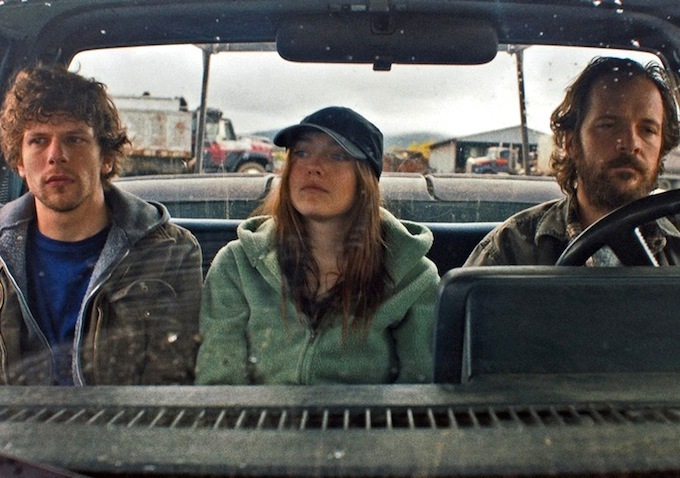 For want of a better description, Kelly Reichardt’s films are often called “minimalist.” They are made simply, without a lot of technical razzle dazzle, and they concentrate on characters, not big effects. But just because Reichardt eschews the big melodramatic moment doesn’t mean her films are emotionally barren. Her “Old Joy” was an aching study of two men on the brink of middle age who have outgrown their friendship. “Wendy and Lucy” will resonate with anyone who has loved a pet. And her Western “Meek’s Cutoff” was a harrowing tale of settlers lost on their journey through the Great American Desert. “Night Moves” may be her most conventional film to date. It’s a thriller, a genre with whose tropes we’re all familiar. And yet the gentle Reichardt touch is evident everywhere, with an emphasis on atmosphere and slowly building tension rather than big action set pieces. In fact, the film’s biggest moment takes place off screen.